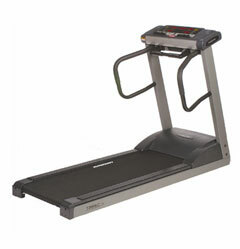 The Trimline T380 light commercial treadmill is the most expensive treadmill from Trimline. This unit was built and designed for residential or light commercial use. If you want power, stability and quality in your treadmill, then this is the unit for you. It is currently the biggest and most powerful Trimline treadmill in the market. However, it is a $3,000 machine so be sure to check your budget to know if you can afford it. This light commercial unit boasts a 3.0 HP continuous duty US made drive motor that can reach up to 11 mph and 12% incline so you’ll surely get an intense workout no matter what fitness level you’re in. If you love to workout in your target heart rate zone, then this is a good treadmill to have. It comes with 2 heart rate programs. Plus, a heart rate hand grip and a chest strap are included so there’s no need to pay extra. But if you just want an ordinary workout, then you can also choose from the 7 preset and 3 custom programs that are built into this unit. The price of Trimlines had been increasing for the past few years and if it continues, I think more and more people are going to look for alternatives. Also, the ortho belt is also something that may cause problems in the future, but since it is of good quality and has excellent warranties, you shouldn’t worry about this too much. I do not recommend the Trimline T380 light commercial treadmill. Trimline is known for their mid-priced treadmills and not their high end units. If you really want a powerful machine, I suggest you buy from a brand that specializes in commercial or light commercial treadmills. If you plan on buying a Trimline T380 light commercial treadmill, I suggest you buy it at Amazon. You can get it for $2,998.00.